What is the Aircast Hand & Wrist Cryo/Cuff? Hand & Wrist Cryo/CuffÃ¢â€žÂ¢ for use with the Aircast Cooler to relieve pain and swelling in the hand and wrist. 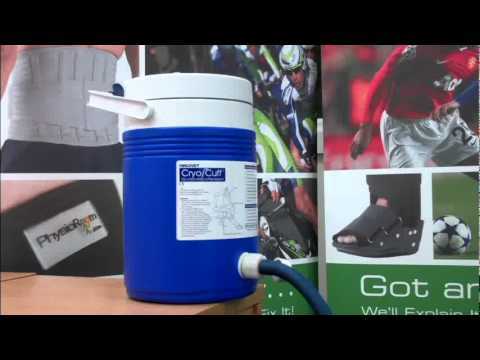 The Aircast Cooler is (available separately or together as a complete kit). Ice therapy and compression are the best treatment for hand & wrist swelling and pain that can accompany all hand & wrist injuries, such as sprained wrist; dislocated wrist; hand & wrist arthritis; broken hand; broken wrist; Carpal Tunnel Syndrome; and following wrist arthroscopy and hand & wrist surgery. The Hand & Wrist Cryo/CuffÃ¢â€žÂ¢ is one-size for adults. The Aircast Hand & Wrist Cryo/CuffÃ¢â€žÂ¢ works with the Aircast Cooler (available separately) to relieve hand & wrist pain and swelling. It's incredibly simple to use at home. Just fill the Aircast Cooler with ice and water. The Cooler holds 3.5 litres of water and ice - enough for 6-8 hours of ice therapy - a much longer therapeutic period than an ice pack. The Cooler is attached to the Aircast Hand & Wrist Cryo/CuffÃ¢â€žÂ¢ which snugly fits the hand & wrist joint. Simply elevate the Cooler above hand & wrist height to fill the Wrap with ice cold water to provide ice therapy and compression. USE:To relieve pain and swelling in the hand and wrist. COMMON CONDITIONS:Hand & wrist arthritis; broken hand; broken wrist and Carpal Tunnel Syndrome. SIMPLE USE:It's incredibly simple to use at home. Just fill the Aircast Cooler with ice and water. COOLER:The Cooler holds 3.5 litres of water and ice - enough for 6-8 hours of ice therapy. SIZE:The Hand & Wrist Cryo/Cuffâ„¢ is one-size for adults. Aircast Hand & Wrist Cryo Cuff - Reusable Injury Cuff - Reduce Wrist & Hand Pain, Swelling & Inflammation is in stock and available for immediate dispatch from our Warehouse facility in Lancashire, UK. Orders placed by 4pm Monday to Friday (excluding Bank Holidays) are dispatched the same day. If you need your Aircast Hand & Wrist Cryo Cuff - Reusable Injury Cuff - Reduce Wrist & Hand Pain, Swelling & Inflammation in a hurry, next working day delivery is available for UK mainland addresses.